In both Greek and Roman mythology the trident has been the symbol of the nautical gods – Poseidon and Neptune. In Trident’s Power it’s Poseidon who’s wielding the giant fork so we know that this online slot from Playtech/Virtue Fusion is based on the ancient Greek civilisation. It’s big, colourful and you get to choose which bonus feature you’d prefer so keep reading for the full review. 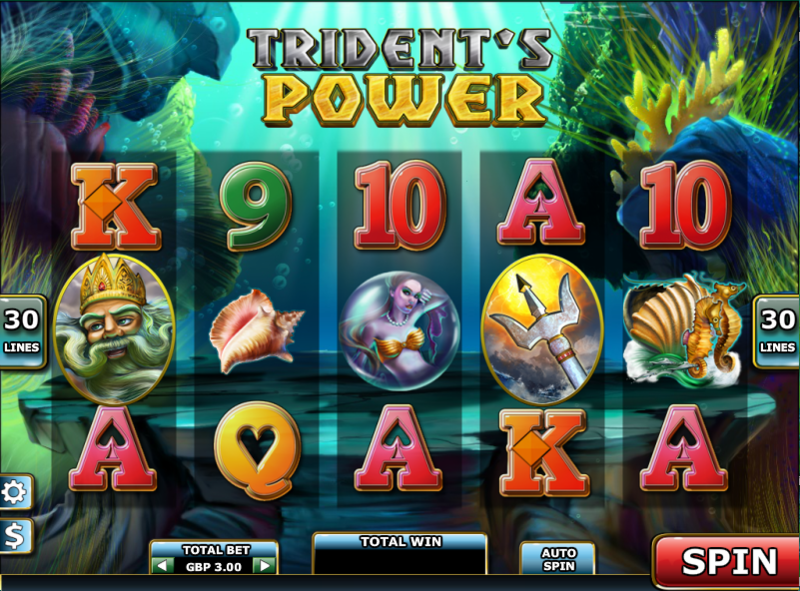 Trident’s Power is a five reel slot with three rows and thirty fixed paylines; it is of course all set underwater in the kingdom of this watery deity so the backdrop to the reels features plenty of undersea fauna behind some sort of stone altar. The high value symbols include a mermaid, seahorses, a Greek ship and a conch shell; lower values are the standard 9, 10, J, Q, K and A. The wild symbol is the trident and if it appears in a winning combination will multiply that particular win by 3x; Poseidon himself is the scatter and he activates the main feature. 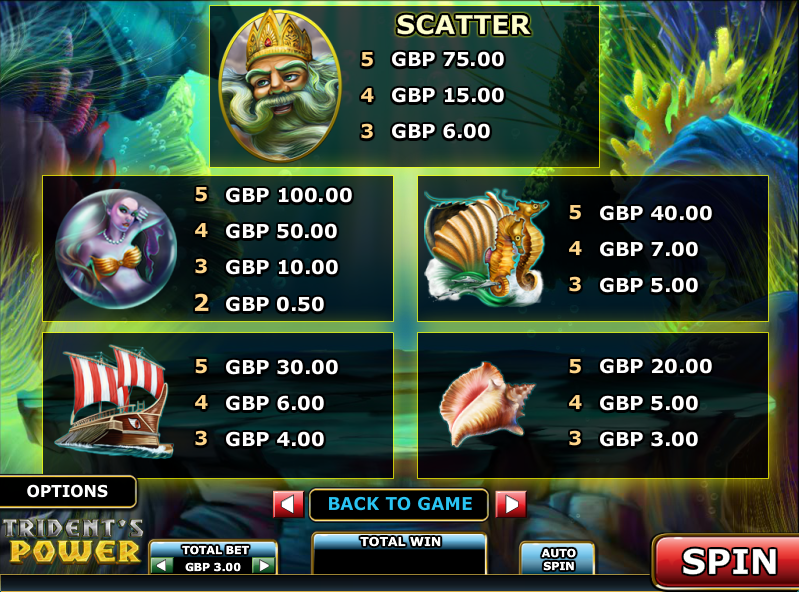 This feature is triggered by landing three or more of the Poseidon scatters anywhere in view for which you will receive a combo payout plus the chance to pick from three free spin options. Unfortunately it’s not possible to trigger any more spins from within this round. Using our admittedly unscientific method of calculating which is the best free spins option to choose (multiplying the elements together), we advise going for five free spins. You may prefer the extra excitement of 25 spins though – the choice is yours. Trident’s Power is largely run-of-the-mill but we like the ability to choose your free spin option; it’s worth a few spins and it comes with an RTP of 95.97%.